If you like having a garden with as little re-planting as possible every year – here is a list of top 10 rated perennials for you! 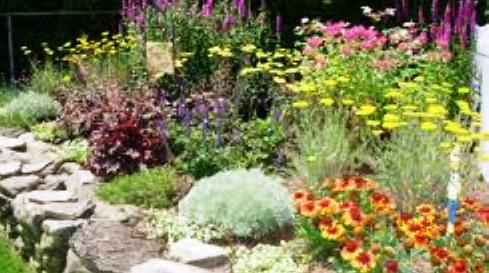 Personally I have been adding perennials to my garden each year in an effort to have nice mature flowering plants that keep coming back year after year. And added benefit? Because they get larger each year, you can take pieces off and make your friends happy by helping them build their gardens! One of the most popular perennials. It can be used in rock gardens, or as an edging or put into tubs and pots. Plant start as a spreading patch of small green leaves and work into bearing loads of starry, violet-blue flowers. It starts blooming in early spring and blooms for weeks and weeks. It work very well when used as a ground cover over a small area – like under shrub roses. It is possible that it will bloom again in the fall. Sedges are grass-like plants, usually preferring areas with moist, rich soil. This one forms a low cascading clump with leathery green leaves, with bright yellow stripe down the centre. It has brownish flowers which are kind of insignificant. great choice for edging or in the rock gardens. If the tips of leaves get wind-burn over the winter, all you have to do is trim them with scissors in the spring. This is a great , non-spreading plant and you can divide it into more plants in the early spring. it will tolerate dry shade as well. This plant is very much appreciated for its compact habitat and long season of bloom. It forms a vigorous clump of grey-green leaves, topped by clusters of delicate, dangling heart-shaped flowers in a bright rode-red shade. It si excellent for edging and very good for mixed containers. May be divided in late fall or early spring and removing dead flower will promote further blooms. This plant is excellent for long-season display – it forms a midsize mound of deep green leaves with loose clusters of bright violet-purple cup-shaped flowers, starting in early summer. It does very well when used as a border and even better when used in a mixed container. It will flower for weeks or months, particularly in region with cool summers. You can prune it back by half to rejuvenate if it is flowering during hot weather. It also changes colour into a beautiful bronze shade in the fall. This plant often offers a tremendous new range of colours – especially for shady areas. It will form a mound of large, smooth almost jet-black leaves with a spray of creamy flowers that appear in June. In warm regions, it is best to plant into shaded area – it actually prefers full shade. And it can be used in borders, as an edging or planted into containers. Foliage should not be trimmed back in the fall, the plants can be cleaned up int he spring to removing any withered or tired-looking leaves. These are one of the most popular of perennials – especially if you are looking for plants that do well in shaded areas. There are hundreds of varieties available. The plants form a sturdy mounds of foliage, topped with lily-like blooms in a number of colour varieties. Hostas are suitable for planting in just about any area and are also OK to plant in tubs or containers. They will go completely dormant in the fall, but can be easily divided in either spring or fall or just left alone for years. These beauties are absolutely perfect for planting in a sunny border area. Shasta Daisies are are an especially compact selection with masses of single white flowers, each with a yellow centre. They are excellent for cutting, work perfectly in edging or in mixed containers. Removing faded flowers will greatly increase the blooming time. Plants can be divided in the spring every 2 to 3 years to maintain vigour. These are old favourite for beautiful blooms in late spring and are prized for their large, colourful and fragrant blooms. Plants form a bush of dark green leaves that will stay attractive all season. It features single flowers of bright rose pink with contrasting creamy yellow centre. Peonies seldom need to be divided or moved, if you need to do that, they should be carries out only in the fall. They will flower the best in a sunny location and you should trim off old stems to the ground in late fall to prevent disease problems. This plant is one of the best perennials available and it is a native North American wildflower. Plant make a bushy, clump with a huge display of brown-eyed, golden orange daisies that bloom from mid-summer through the fall. These flowers are excellent for cutting and removing faded flower will greatly increase the blooming time. Plant may be easily divided in early spring and added bonus to this plant is its attraction to butterflies. These are invaluable perennials for their rich display of spiky flower in the early summer. They grow medium to tall with flowers of deep violet-blue colour on unusually dark stems. Removing faded blooms will increase repeat flowering and the flowers are excellent for cutting. These plants also tolerate drought once they are established and will be Ok in heat and humidity. Divide plants in early spring or fall and clip back hard after blooming to rejuvenate the foliage. And added bonus is that this plan will attract butterflies and hummingbirds. Hope you have enjoyed this information – please send me your comments, suggestions and experiences, your input is always welcomed and very much appreciated!